The word “tag“, at least in the way we mostly use it today, has actually been “invented” by graffiti and street artists. It’s something like the signature of the artist, a short graphical logo to credit their work. I just recently read, that one of the first graffiti tags appeared in Philadelphia around the late 1960s. A guy, who wanted to impress a lady just sprayed his name and the one of his crush on her desk and all over buildings on her way to school. Today, tagging has become a mainstream technique in street art and has even arrived in everyday language (not only english) – at least for those somewhat familiar with the world wide web and blogging software. To get back to street art: some artists even use their tag as their main artwork and artistic motif. 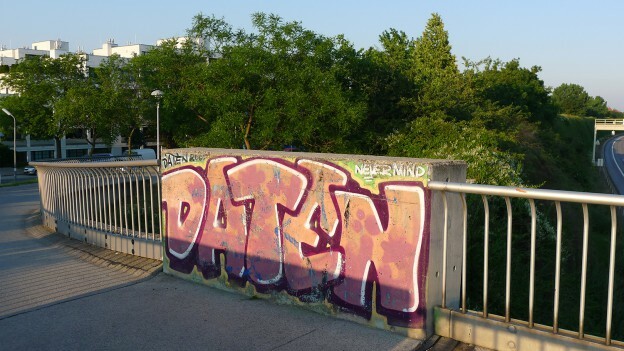 In Vienna, one of those artists is “Daten” (“Data”). His tags can be found all over Vienna, but I think especially around subway stations or subway lines. “Daten” is not your typical cool underground artist name – it’s an omnipresent buzzword in the datadriven place we live in on the one hand, and it’s a very profane, shallow and anti-poetic noun on the other hand.